For all of those reading right now, I appreciate getting through this very ‘click-baity’ title above. Good writers use click bait to get online surfers to go beyond the title and actually take time to CLICK and hopefully read the article they wrote. I’ll admit it. The potentially toxic practice of click-baiting people is beyond the scope of this blog. But I did get you reading, didn’t I? Hmmmmmm… I’m just the worst. But below I’m going to talk about the Farmers’ Almanac a bit and try to convince you to never believe their winter forecast again. Let’s go. Chances are… at least a few people read ‘fake news’ and get triggered just at the sight of the term alone. You’ve run into it before. There are plenty of examples where weather, journalism, and politics intertwine in our culture… the topic of climate change is one of those. But that deserves a complicated discussion that is well beyond the scope of this blog as well. Many people have their own opinions or biases on all three. And once a person plants their beliefs into one side or the other, regardless of their own knowledge, credentials, or the news source they gather their information… it becomes so much more difficult to convince someone in a professional debate, much less in a casual conversation. Challenge Accepted! 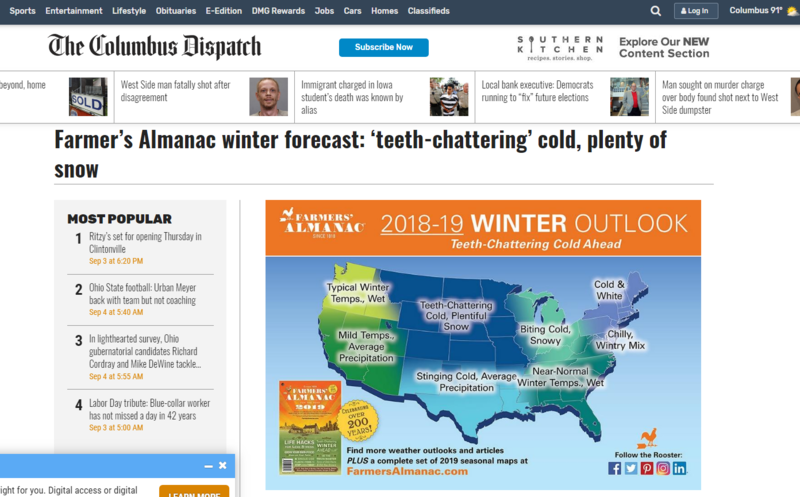 As a meteorologist, I admit it is frustrating trying to tell a person stuck in their beliefs on things like: chemtrails aren’t real, climate change is a thing, meteorologists aren’t wrong half the time, and of course that the pseudo-forecast in the Farmers’ Almanac is worthless and you shouldn’t listen to it. But I pick and choose my battles. But we see this fake news all over the place. It is something that flies around so much you may think it’s just the latest hot-button issue that gets tweeted out more times than a bird chirps. What source is actually credible? It is hard to find a news source that is both trustworthy and entertaining for you. There are so many out there. And you deserve that credibility. You deserve the best. Journalism should about telling YOU the truth, regardless of clicks or money. And many times it’s on a topic that will make you uncomfortable. But sometimes getting out of that comfort zone is the best thing to keep us as people moving forward. And the Farmers’ Almanac is NOT truthful in their winter forecast. They lie to you. I will tell it like it is, even if it comes off as blunt. But you deserve honesty. I am tired of our culture giving them a break. It’s not OK. And you need to follow news sources that are credible. It’s on you too. In reality, fake news has been around for a very long time. As long as there has been journalism, there has been fake news. By definition, fake news is “a type of yellow journalism or propaganda that consists of deliberate misinformation or hoaxes spread via traditional print and broadcast news media or online social media. This false information is mainly distributed by social media, but is periodically circulated through mainstream media,” – Wikipedia. I would make an argument that the Farmers’ Almanac is an example of this definition. They don’t share their long-range formula with the scientific community or anyone. Forecasting for an entire season, much less for a seven day or even a day out requires multiple math equations or formulas pumped into complex weather models. It takes more than one formula. And they don’t share theirs. It’s like back when traveling salesman wouldn’t share their ‘magic formula’ from their miracle product that will cure everything from your cold sores, to headaches, to even cancer… ALL IN ONE! Sounds too good to be true. “Come one, come all… gather around… I have for you this miracle weather forecasting machine complete with ONE FORMULA that will accurately forecast your ENTIRE WINTER! Both what snow you can expect and how cold it will be,” your friendly neighborhood con artists at the Farmers’ Almanac. Semi-accurate representation of a Farmers’ Almanac salesman. Problem #1… their formula was “altered slightly” from the 1st one made back waaaaaaaaaay back in 1818. 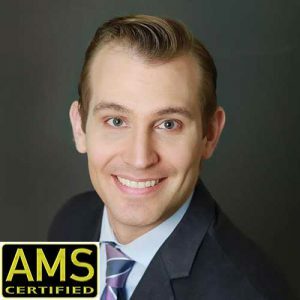 We live in a time today that has seen scientific, engineering, mathematical, and technological marvels that have lead to multiple advancements in weather forecasting. I would never believe a model that so firmly stands by only obsolete information that is nearly 200 years old and refuses to get with the times. Problem #2… they throw out words and phrases like: “mathematical,” “astronomical,” “sunspot activity,” “tidal action of the moon,” “position of the planets,” and a “variety of other factors” that they don’t specify. They are trying to sound smarter than they actually are. In reality, these things mean very little to a seasonal outlook. But an average person who doesn’t take the time to inform themselves can be gullible and buy in to what the Farmers’ Almanac is selling. Problem #3… they keep their science behind closed doors. I can understand the business behind this. But it is unethical from a weather forecasting standpoint. Ultimately it is YOU that suffers from believing their forecast. I would never recommend the Farmers’ Almanac forecast for any plans whatsoever. Whether it’s from something as small as planning an outdoor camping trip… to planning an outdoor wedding… to something that effects something as big as a multi-million dollar business deal. The Farmers’ Almanac publishes millions of copies every year. Each one complete with their winter forecast. And you know what… that’s OK in my book! I need to point that out. The right to free speech and press is important! It’s more important than us all and must be maintained. It’s an American right that is way more important than anything I believe. 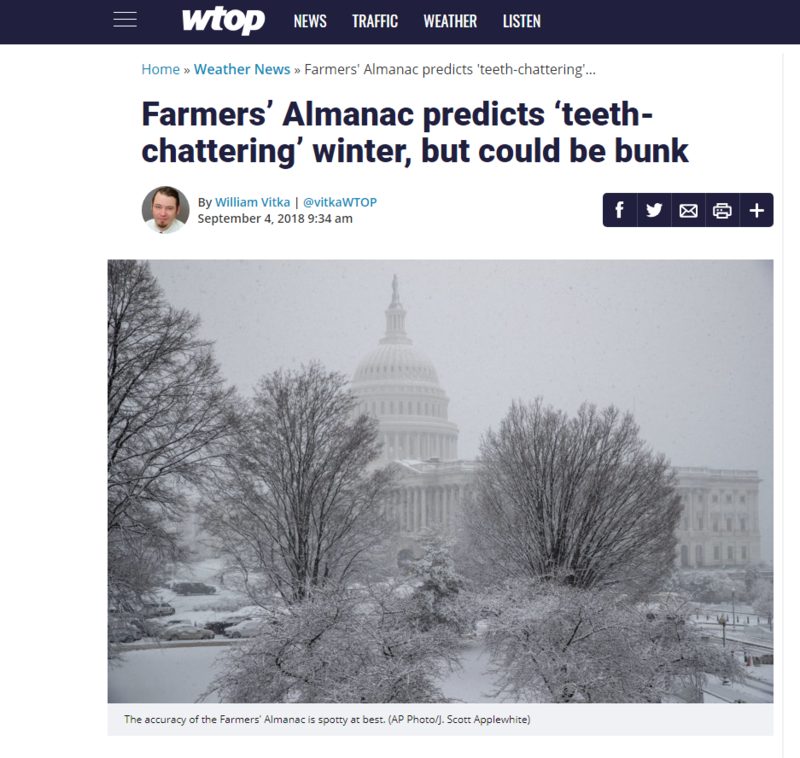 That gives me the right to blog and complain about what the Farmers’ Almanac does. But it also gives me the right as a forecaster to do what I can to make sure YOU get the most accurate forecast information possible. And the Farmers’ Almanac does not give you that. 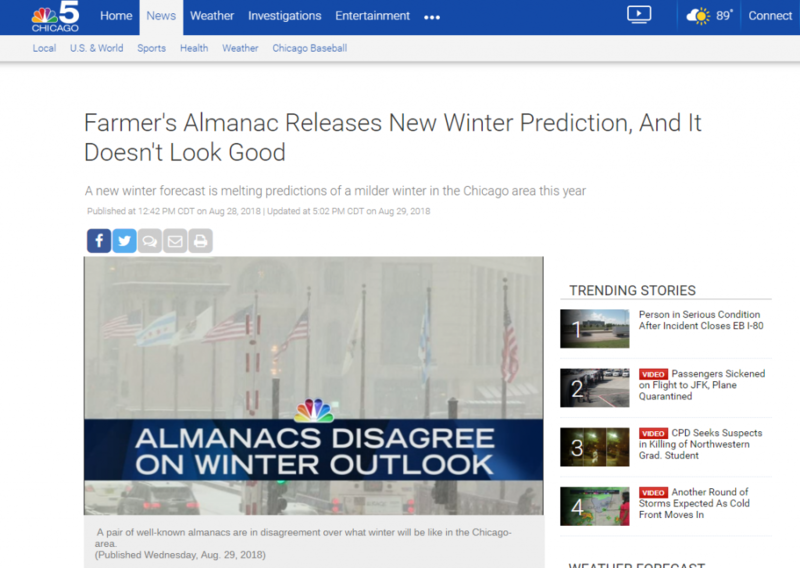 Publishers point to “many longtime Almanac followers claim that our forecasts are 80% to 85% accurate” on their website. Professional meteorologists refute this pointing to historical results of below 50 percent accuracy rate. “The ability to predict events that far in advance is zero,” according to Penn State meteorologist Paul Knight. The use of planetary position, or astrology, for the purpose of weather forecasting originated from the second-century Alexandrian scientist Ptolemy. Like all other uses of astrology, it is now considered a discredited pseudoscience. So let us review… they claim to be right 80% of the time… but they are actually right 50% of the time at best. There is a click bait news culture out there currently. Admittedly, TV and printed news sources do it because it’s easy and they need to make money too. Forgive me if I’m generalizing. But you don’t have to go far to see TV news stations will quickly share what the Farmers’ Almanac spits out. News stations have weather teams… mostly with degreed and established meteorologists. Most of them will not agree with the winter outlook thrown out by the Farmers’ Almanac. So I ask news stations to please listen to them! And ignore what the Almanac says. Readers will see your headline and believe that forecast! Then when the Almanac is wrong, people will blame the real forecasters instead of the Farmers’ Almanac. The Farmers’ Almanac will quickly point out the times they are correct and accurately forecast a winter. But you know… if you keep buying lottery tickets, you will eventually get a number or two correct too. There are two Almanacs out there in the universe. There’s the Farmers’ Almanac, which is what I’ve been going on about. And then there’s something completely different… The Old Farmer’s Almanac. So, as you’re out and about in the future, maybe seeing one or the other in the checkout isle at the grocery store, avoid mistaking the two. It’s the Farmers’ Almanac weather information you should ignore. It’s important to find sources on weather forecasting that you can trust. So I guide you to our company Praedictix! Here we have a team of professional meteorologists more than capable of providing you seasonal forecasts and much more. Co-Founder, President, and Senior Meteorologist Paul Douglas is here! Ever hear of him!? We’re expecting an El Niño this winter. Contact us anytime for your forecasting needs. Click the big ‘Contact Us’ picture below to go right to our website. Hope to hear from you soon. You got weather questions? We’ll be more than happy to answer them for you. Go ahead and buy the Almanac. It has entertainment value that readers love. They’ve been doing it since 1818. Obviously they know what they’re doing, being in business this long. Not many businesses can say they’ve been alive for over 200 years. Enjoy the fun and entertainment stuff in there. But when it comes to weather… avoid the Almanac and leave it to the professionals like us. PLEASE. Thanks for reading. I’m not sure we can do that on our end. Can you “unsubscribe” if you scroll down to the bottom of those emails?